Pelle Eklund was one of the most gifted skaters and playmakers to play for the Philadelphia Flyers. 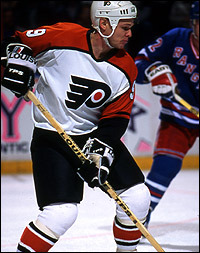 The club’s all-time leading point getter among European-born players, the elegant Eklund spent eight seasons in Philly. As popular as he was with the Spectrum crowd, his Philadelphia popularity paled in comparison to the hero status Pelle enjoyed back in Stockholm. did not fit the stereotype of the big, bruising Philadelphia forward; rather, Eklund played more in the traditional Montreal Canadiens mode. Eklund was small, lightning fast, and finesse-oriented. After Bobby Clarke, Eklund may have been the best pure playmaker the Flyers have ever had. Fourteenth on the Flyers all-time point list, he compiled the most points in orange and black among all European-born players. Eklund ranks ninth on the team’s all-time assist list, despite playing fewer games (529) for the Flyers than all but one of the top-15 assist men in club history. He topped the 50-assist plateau three times in his Philadelphia career. On March 22, 1963, Per-Erik "Pelle" Eklund was born on the west side of Stockholm, Sweden, in the Västerled parish of Bromma borough. Eklund was always an excellent all-around athlete. A fine soccer player, Per-Erik later took up tennis. His best sport, of course, was hockey. Like most young Swedish players, his ultimate goal was to wear the Tre Kronor (Three Crowns) of the Swedish national team and to win the World Championship and/or an Olympic medal. The possibility of an NHL career was a secondary consideration to him, even as Börje Salming, Anders Hedberg, Ulf Nilsson and Inge Hammarström were opening doors for Swedish players to come to North America. Pelle worked his way up quickly through the ranks of Swedish hockey, starting with Stocksunds IF at the Division II (lower minor league level). After dominating the competition, he made his Elitserien (Swedish Elite League) debut for AIK Solna in 1981-82. Founded in 1891, the club from the suburbs of Stockholm produced another famous Pelle from Flyers’ history – Per-Eric “Pelle” Lindbergh. Eklund quickly became one of the better players on the team, showing brilliant puckhandling and playmaking ability. Eklund also possessed a soft finishing touch but strongly preferred passing the puck to shooting it; a trait that would mark Pelle's entire career. Eklund quickly became a favorite of the AIK fans, but it took awhile for NHL scouts to take notice, even after Eklund took part in the 1981 DN Cup tournament in Stockholm, competing against members of the New York Rangers. Eklund was not selected in either the 1981 or 1982 NHL Entry Drafts despite being eligible both years. After his sophomore season with AIK, Eklund was selected in the eighth round of the 1983 draft by the Flyers braintrust of Bob McCammon and Keith Allen. Eklund came highly recommended by Flyers skating (and future assistant) coach Ted Sator, who had been coaching in Sweden during the season. The next year, Eklund blossomed into stardom, winning the Golden Puck as the Swedish league’s MVP award and leading AIK to the championship. By now he had become a folk hero among AIK fans. Eklund excelled at penalty killing as well as the power play. His line with Rolf Edberg and Peter Gradin was one of the best in Swedish hockey history. After enjoying a very strong regular season in 1983-84, Eklund went berserk in the playoffs, scoring six goals and adding seven assists in six playoffs games as AIK rolled to the Swedish championship. Eklund also experienced success on an even bigger stage: the 1984 Winter Olympics in Sarajevo, Yugoslavia. He put up eight points in seven games at the Olympics and was a major force in helping Tre Kronor win the bronze medal. The next year, after playing for runner-up Sweden at the 1984 Canada Cup, Eklund scored 16 goals and added 33 helpers in 35 games. He placed second in the Swedish league scoring charts. By the end of Eklund’s stay with AIK, he enjoyed near godlike status among AIK loyalists, especially with its infamous fan club, dubbed "The Black Army" (AIK wears black jerseys with a shield crest). A brief explanation about the AIK organization and European fan clubs may be helpful to North American fans that are not familiar with the workings of either. AIK, which is an acronym for the Swedish words for "Everyman's Athletic Association Club," was founded in 1891 and incorporated a professional hockey team for the first time in 1921. The AIK organization is comprised of various youth teams in both soccer and hockey; at the adult level are a pro soccer team and a pro hockey team. This sort of youth-to-adult development structure is common in many European sports programs. Fan clubs in Europe are also a little different than those in the United States; at least for professional sports teams. European hockey fan clubs are modeled on the style of soccer fan clubs. There are team fight songs that are sung all game long, special team cheers that are led by the fan club and a nearly fanatical sense of loyalty to the team by the fan club members. The hockey fan clubs in Europe tend to exhibit a considerably lesser degree of hooliganism than the soccer fan clubs. While incidents of rival fan clubs clashing with each other or the police are not unheard of, the hockey teams’ clubs are more noted for singing for the home team and taunting the opposition and refs than they are for violence. For many years, the most notorious of all the Swedish fan clubs was AIK's Black Army. The Black Army was the loudest, and often the most obnoxious, of the fan clubs in Sweden; worshipping the AIK players, while hurling vile invective at the opposition (especially hated rival Djurgården, which is also based in Stockholm). Pelle Eklund could absolutely do no wrong by the Black Army. By 1985, he was the fan club’s most beloved AIK player. When the news broke in June of 1985 that Eklund had accepted a two-year contract offer from the Phiadelphia Flyers, some of the more rabid Black Army members decided that something had to be done to stop him from leaving. The fan club organized a peaceful demonstration outside of the American embassy in Stockholm, carrying signs and chanting, “Pelle Eklund must stay, he must stay with AIK.” Of course, all the Black Army's rally succeeded in doing was baffling some American embassy workers who had no idea who this Pelle Eklund was and why the locals were so adamant he not be allowed to leave Sweden. Across the Atlantic Ocean, the Flyers’ signing of Eklund barely caused a ripple of fan interest in Philadelphia, much less the frenzy it touched off among AIK fans in Stockholm. The Flyers issued a brief four paragraph press release that got buried in the back of local sports sections. But Sator had regaled new Flyers General Manager Bob Clarke with a detailed scouting report on Eklund and assured him the player’s skills more than made up for his lack of size (5-10, 175 pounds). Over the next eight-plus years, Philadelphians would discover what the Flyers brass and the folks in Stockholm already knew. Pelle Eklund was one magical little hockey player. At Eklund's first training camp with the Flyers in 1985, the diminutive Swede made an immediate impression on his new teammates. “The first thing that impressed us was how Pelle skated, found the open man and made plays while skating, not gliding,” Tim Kerr recalled in the Greatest Players and Moments of the Philadelphia Flyers. Although generally quiet and soft-spoken, Eklund was quickly accepted by the Flyers players. Team captain Dave Poulin, who had played in Sweden, was very welcoming to the new player and the other players followed suit. Further easing Eklund’s transition was the presence of fellow Swedes – and Stockholm natives – Pelle Lindbergh and Thomas Eriksson, as well as Finnish forward Ilkka Sinisalo. New Flyers coach Mike Keenan was not quite as ready to embrace Eklund as the Philadelphia players. Keenan immediately loved Pelle's speed and his passing ability, especially on the power play, but he also viewed Eklund as being too soft physically and far too hesitant to shoot the puck when he had open shots. While assistant coach Sator insisted the player could adapt to the physical style of the NHL, Keenan had his doubts. Early in his Philadelphia career, Keenan generally confined Eklund to fourth line and power play duty. With the likes of Kerr, Sinisalo, Mark Howe, and Brian Propp already assembled for the man advantage, the ice vision and passing touch Pelle Eklund helped it all come together. Only the Edmonton Oilers had a more dangerous power play. The Flyers got off to a roaring start in the 1985-86 season. But Lindbergh’s death after a November 10 car crash put a pall over the entire season, and forever changed the lives of every member of the team, including Eklund. When team members gathered at the hospital to say goodbye to Lindbergh before his respirator was turned off, Eklund was too emotional to go along. He couldn’t bring himself to see his friend in that state. “It felt too hard. I felt just empty inside and all I could do was to try to move on,” Eklund recalled in Pelle Lindbergh: Behind the White Mask. Eklund and the other Flyers found mental respite from their grief by focusing on hockey. The Patrick Division champion Flyers’ power play was nothing short of deadly with Howe at the point, Kerr in front of the net, and Eklund threading the needle. Despite his limited even strength playing time, Eklund racked up 51 assists and 66 points in 70 games during his rookie year. He assisted on no fewer than half of Kerr's 34 power play tallies that season. When Eklund elected to shoot the puck, he often found the back of the net. Scoring 15 times as a rookie, Eklund netted five game-winners. “From about our 50th game, Eklund was our top offensive centerman. He attracted so much attention that he freed his wingers. That's one reason why Tim was free for those power play goals,” recalls Poulin. After a while, Keenan realized that Eklund was good enough to play in all situations and gave the Swede increased ice time. But the Flyers simply ran out of emotion the spring after a trip to the 1985 Stanley Cup Finals and the loss of Lindbergh. In a major upset, the New York Rangers ousted the deeper, more talented Flyers in the first round the 1986 playoffs. In the series, Rangers goaltender John Vanbiesbrouck noticeably outplayed the Flyers’ Bob Froese. That made the loss of Lindbergh finally become as noticeable on the ice as it was as off the ice. It was small consolation to Eklund that the playoff loss made him eligible to play for Sweden in the 1986 IIHF World Championships. His mood brightened, however, when he helped lead the Swedes to a silver medal. During the 1986-87 NHL season, Eklund had a decent sophomore campaign (41 assists, 55 points). But he didn’t truly explode into his own until the postseason. Backstopped by Vezina Trophy and Conn Smythe Trophy winning rookie goalie Ron Hextall, the Flyers came even closer to winning the Cup in 1987 than they did with Lindbergh's 1985 team. This time, they stretched Edmonton to a full seven games in the Finals, despite playing with an injury depleted lineup. In the absence of Kerr, the forwards who picked up most of the slack were Eklund, Brian Propp and Rick Tocchet. It seemed that every time you looked up during the 1987 playoffs, little Pelle was blowing by another defenseman to go in all alone. For a little while, at least, Eklund even lost his reticence about shooting the puck. Eklund was nothing short of dominant during the Patrick Division Finals against Montreal. Pelle burned the Canadiens multiple times throughout the series, creating scoring chances almost at will. In Game Four of the series, he scored a hat trick. Game Six was held in the Montreal Forum, with the Flyers looking to clinch the series. Before the game even started, the Flyers and Habs engaged in a wild pre-game brawl, instigated by little-used Flyers defenseman/enforcer Ed Hospodar after the Canadiens Claude Lemieux insisted upon performing his end-of-warmup ritual of shooting the puck into the opposing net. The player, who only had one major penalty in his entire career and never topped 23 penalty minutes in a season, was relieved to find a friendly foe on the ice in fellow small, skilled, pacifistic Swedish forward, Mats Näslund. The two paired off on the ice, discussing the situation in their native tongue as punches flew around them. While fully supportive of their respective teams, they agreed the brawl was unnecessary. Once the game commenced, Pelle was back in his element, ready to give his all for the Flyers. He tallied three points, helping Philadelphia to down Montreal and win the Wales Conference. Eklund's mastery continued through the Stanley Cup Finals. In all, Pelle tallied seven goals and a whopping 20 assists in the Flyers’ 26 games during the 1987 playoffs. Unfortunately for Eklund, his 1987 playoff run raised expectations for him to levels he was not always able to meet in terms of goal-scoring prowess. Eklund, who posted a stellar 12.9 shooting percentage in his NHL career, had a deadly accurate wrist shot and backhand shot. But first and foremost, Eklund was playmaker. He simply loved the art of passing the puck and spent countless hours working on his passing touch. As a result, Eklund always preferred to dish the puck and only looked to shoot if he was on a breakaway or staring at a gaping net. While his coaches and fans were thrilled with all the assists he racked up each year, they always craved more of his goals, which were often spectacular top-shelfers or shots slipped neatly through the five-hole. When Eklund got goalies one-on-one on breakaways, he could make the keeper look foolish. Despite his occasional frustrations with Eklund’s general reluctance to shoot, Keenan came to have great confidence in the player’s all-around abilities. During the last season under Keenan (1987-88) and then during the Flyers coaching tenures of Paul Holmgren and Bill Dineen, Eklund saw even-strength ice time at both center and left wing, worked the half-boards on the first power play unit and served on the Flyers’ primary penalty-killing unit. In 1988-89, he had 51 assists and 69 points in 79 games during the regular season, including nine special teams goals among the 18 he tallied. In the playoffs, he had 11 points, helping the Flyers reach the Stanley Cup semi-finals after a mediocre regular season. Pelle Eklund became the Flyers best overall forward during the lean years of the late 1980s through the early 1990s. Although he only topped the 20-goal plateau once in the NHL, he had 50 or more assists three times. 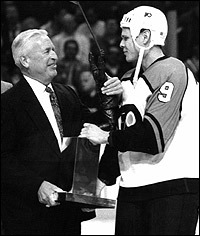 In 1990-91, Eklund was selected as the winner of the Bobby Clarke Trophy as team MVP. That season, he registered his career high in goals with 23 and added 39 helpers despite missing 14 games with injuries to both of his knees. He also scored three shorthanded goals. After the season, he brought joy to his homeland, playing a crucial role in Sweden’s gold medal at the 1991 IIHF World Championships. The next year, he reached the 50-assist mark for the third and final time in the NHL, putting up 69 points in 73 games. Among his 19 goals in 1990-91, Eklund had four game-winners and eight special-teams markers. In his most memorable game of the season, Eklund single-handedly led the Flyers over the New York Rangers on March 23, 1991. Scoring a hat trick on three shots against Rangers goalie Mike Richter, Eklund also set up Rick Tocchet for his 39th and 40th goals of the season. Most of Eklund's Philadelphia hockey memories were happy, even as the team gradually fell from Stanley Cup contender to a non-playoff team. But he went through some tough personal times when he divorced from his first wife, Annette. After their divorce, his ex-wife took their son, Daniel, home with her to Sweden. Pelle used the Christmas and All-Star breaks in the NHL schedule as well as a four-day break in the Flyers schedule as a chance to fly back to Stockholm to visit his son. He then flew back to North America to rejoin the team, showing hardly a trace of the jetlag or emotional strain he felt. In 1991, Pelle became engaged to his second wife, Liselott. They married the next year. The couple has two daughters, Nathalie and Caroline. By the time the Flyers enjoyed their resurgence of the mid-1990s, Eklund was gone from the team. He struggled to recover from a broken foot and could never quite find his rhythm again. Pelle was limited to 51 largely unproductive games in 1991-92. The next season, Eklund was slotted to play left wing on the Flyers’ first line with Mark Recchi and rookie center Eric Lindros. Before the season, the trio, plus Flyers Executive Vice President Bob Clarke, filmed a television advertisement for frozen pizza. The ad ran for most of the season – including cardboard displays at area supermarkets — but the team’s intended first line never really came together on the ice. Eklund tore knee ligaments during the preseason and missed the first 22 games of the season. Meanwhile, Brent Fedyk joined Lindros and Recchi (the line was dubbed "The Crazy Eights"). After finally returning to the lineup, Eklund enjoyed a mini-resurgence under new head coach Bill Dineen. Although the Flyers finished out of the playoffs and were sub-.500 for the season, Eklund managed 49 points in 55 games, including a plus-12 rating. The beginning of the end for Eklund in Philly came with the arrival of new coach Terry Simpson in 1993-94. Eklund struggled and Simpson scaled back his ice time. With the rapid emergence of rookie Mikael Renberg adding to the young nucleus of Lindros, Recchi and Rod Brind'Amour, Pelle's days in Philly were numbered. “Renberg came in and you could see right away that he was going to be a very good NHL player. He stepped right in and my ice time decreased. I was also struggling with injuries (especially a sports hernia). I knew it was possible I could be traded soon, but you could see the Flyers would start winning again soon,” Eklund said in 1996 to the Swedish newspaper, Dagens Nyheter. After 48 games with the Flyers in 1993-94 (in which he tallied just one goal and 16 assists), Flyers general manager Russ Farwell traded Eklund to the Dallas Stars for an eighth round pick in the 1994 NHL Entry Draft. In deference to Dallas superstar Mike Modano, Eklund donned the unfamiliar number 6 instead of the number 9 he’d worn throughout his career. Pelle dressed for five regular season games for Dallas, scoring twice and adding an assist. He was held quiet in nine playoff games for the Stars. After the 1993-94 NHL season, Pelle dropped out of the consciousness of most North American fans. His career was not over, however. Pelle made a triumphant return to Swedish hockey in '94-95, joining Leksands IF (also known as Leksand Stars). Much like the NFL’s Green Bay Packers, Leksand is a tiny market hockey team with a storied history and tradition. Eklund opted to play for Leksand over AIK because his wife, Liselott, is from the Dalarna district of central Sweden and he had a house there that he lived in during the offseason. In order to acquire the Swedish rights to Eklund, Leksand paid 1 million SEK (roughly $200,000 in US money) to AIK; huge money by Swedish hockey standards of the mid-1990s. Eklund proved that the investment was wise. He tallied 50 points in 34 games including 37 helpers to win the Elitserien MVP award. A special moment for Pelle occurred when Leksand made its first trip to Stockholm to play AIK. Eklund, who was injured, was not dressed for the game. But when the arena screen showed Eklund sitting in the stands behind the Leksand bench, the AIK fans rose to their feet and applauded for several minutes. Pelle, who was a little uncertain how the fans (especially the Black Army) would react to him after choosing Leksand over AIK, was greatly moved by the affection the Stockholm crowd showed him. Although'94-'95 was his last truly dominant professional season, Eklund remained a fixture in the Leksand lineup for five years. He also continued to dress for Tre Kronor until 1996, eventually bringing his number of "landskamper" (national team games) to 70 contests. During the 1995-96 season Eklund scored his last professional hat trick, but unfortunately, the goals were expunged from the record book. Leksand dressed a suspended player in the game and, the next day, LIF's victory was forfeited, along with all of its goals. After the 1996-97 season, Eklund was courted by a Japanese hockey team, the Kukudo Bunnies. The club offered Eklund a lucrative salary; far more than Eklund was making in Sweden and probably more than he was worth at that late stage of his playing days. For a time it appeared that Eklund was going to accept the offer but he ultimately decided to finish his career with Leksand. Eklund played two more solid seasons for LIF, playing in both Elitserien and the fledgling (and now defunct) European Hockey League. Pelle retired at the end of the 1998-99 season. Pelle and Liselott make their permanent home in Leksand but Pelle spends much of his time traveling. For several years, he served as a European-based scout for the Phoenix Coyotes. After leaving the Phoenix organization, he took on an assistant coaching job with the Leksand Stars. As much as his hockey playing, coaching and scouting careers have brought him joy, Eklund’s greatest personal hockey thrill was seeing his 20-year-old son, Daniel, follow in his footsteps and become a professional hockey player. Bigger than his father at 6-1 and a right handed shooter unlike Pelle, Daniel donned the famous number 9 for the Leksand Stars, graduating from the team’s junior program to its adult team. With his father behind the bench as an assistant coach, Daniel Eklund played in 13 Elitserien games for Leksand during the 2005-06 season. This past season, he finished the season with a Division I (minor league) team located near Leksand: Borlänge HF. Pelle, meanwhile, is back in the NHL scouting fold. Last summer, he accepted a European scouting post with the San Jose Sharks. He’s been hard at scouring league games and tournaments in Europe for players who embody the same combination of grace and skill he brought to rink every day. “Pelle was an underrated player for most of his career. He had a skill level and creativity that doesn’t come along very often, and he cared about winning more than any personal goals. I’d say he was one of our best forwards for many years,” longtime Flyers teammate Mark Howe concluded.